Summer is almost here and I am always looking for ways to avoid those uncomfortable days where I am burned, bright red, begging for aloe, and promising myself I will never forget the sunscreen again. Inevitably, every year, at least once, this will happen to me. If you’re anything like me, in a few weeks, you will also forget the promise you made to yourself last year, or this year on spring break, or even last weekend for Memorial Day. Recently, I found a magic cure for my problem. One of the reasons I am SOOOO bad about putting on sunscreen is because I love my makeup (obviously, if you have read my other posts), and it tends to smear it up, or change the texture, or mess it up in some other way. Another reason is sometimes, and some brands have strongly smelling, or oily sunscreen that will get all over the place. I am not a fan of getting all messy just to leave the house. Yuck! Seriously, yuck! I do not want to go sit in the sand and have the sand stick to me?! Do you? The reason this sunscreen is different, is because it is a powder!! Yup, a powder. 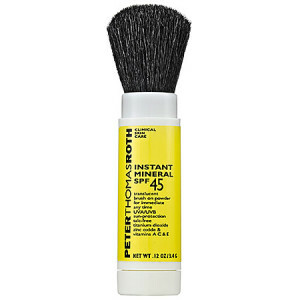 It is made by Peter Thomas Roth and comes in a brush applicator and you just brush it on and go! I can do that! In fact, I do that! I do it every morning, I put it on over my makeup, with no change to the color or effect of the makeup I have on. That is a huge, huge bonus to me! I LOVE it. It is easy to put on my arms, legs, face, and back. Super easy to take in my purse, conveniently sized, and doesn’t leak. It is also great for kids. I have taken it to my friend’s kid’s soccer games and it doesn’t run in their eyes, it doesn’t get in their way, and it protects them from the sun! The one drawback is that it is not waterproof. So, if you swim, you need to reapply when you get out, and it will not work while you are in the water. If you spend most of your time at the beach or pool in the water, this is probably not for you. You will want to stick with a waterproof spray on sunscreen. But, if you are like me, and spend minimal amount of time in the water, and most of the time enjoying the sun and laying out, this is PERFECT!!! You can get it at Sephora for $30. Worth every penny!